A. Currently, it’s intensifying. Inflation is declining around the world and it’s gone negative (deflation) in the Euro area and most recently in the U.S. (see Chart 1). The central banks are fighting these forces with quantitative easing (QE) economic stimulus programs and negative interest rates to help boost their economies and get inflation up to at least 2%. At this point, the biggest danger would be a deflationary downward spiral, which is what everyone wants to avoid. As interest rates fall, it becomes more attractive to borrow rather than save. So central banks are hoping that banks will lend more money to consumers who will spend, as opposed to just holding the money in their bank reserves. That’s primarily why the velocity of money has been falling. The money created via QE programs has been sitting in banks but it needs to get out there and circulate. That’s the main reason why inflation has been declining. That will also help turn the deflationary pressures around and get inflation to finally pick up. It’s not happening yet, but hopefully it will. Q. What are the chances of another economic crisis? A. Based on the fact that the stock market is still bullish, despite its recent decline, and it tends to lead, the economy should continue to plug along in the months ahead. But the global economic foundation is not healthy. The biggest problem is debt and we believe it’s passed the tipping point. 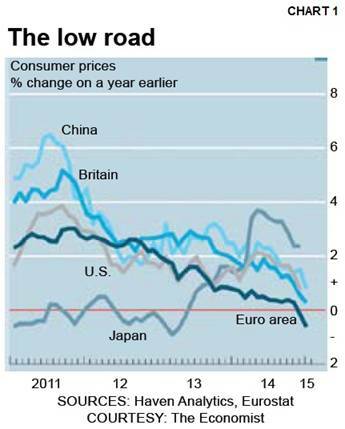 That is, it’s become a real drag on the global economies. In 2007, for instance, world debt was $142 trillion. In 2014, it had soared to $199. That’s a 40% increase in seven years. So nothing has really changed since the last big recession. In fact, it’s gotten worse. There has been no deleveraging and debt is much bigger than the world economy can handle. Many feel this will lead to another crisis or a collapse, and it’s indeed a possibility. Remember, during the last crisis in 2007-08 the world was taken to the brink. Every major U.S. bank would have failed if the Fed hadn’t intervened. And something along these lines could happen again. Debt, for instance, is definitely keeping a lid on global growth. In the U.S., average annual economic growth has only been 1.2% over the past eight years. And that’s the best it could do after years of QE and super low interest rates. Plus, median wealth for over half of the people has also dropped 40% since the last recession. The rich, however, are getting richer via assets that’re rising. So despite the good economic news you keep hearing about, you can see that the underlying economic foundation is on thin ice. Q. How will this affect gold? A. Gold prices fell further, hitting an almost four month low, quickly approaching its November lows. The soaring dollar and expectations of higher U.S. interest rates have pushed gold to the back seat. Low interest rates are bullish for gold because gold is then not competing with the currencies. And with most major countries dealing with low to negative rates, gold moves up in the currency ranking. And indeed it has. Gold, as the ultimate currency, is only second to the U.S. dollar in terms of major currency strength. But the soaring fast paced dollar rise is now causing turmoil in the currency market. This is now very interesting. It almost seems unreal for investors to think the U.S. will raise rates when the dollar is soaring. It already has the highest rates in the major countries. But anyway, at some point coming up pretty quick, the dollar rise will be stemmed, either by intervention or exhaustion. And when that happens, a dollar decline will give gold a boost. To think that gold did not hit new lows near $1143 already during the dollar rise, shows its underlying, subtle strength.